Downtown Chilliwack is the historical centre of our community and plays a large role in the fond memories of many. As we all know, there are no fast and simple solutions to the challenges of renewing a city centre. Achieving our shared vision for Downtown Chilliwack is not one that can be accomplished by government alone. It will require a collaborative effort from our entire community. 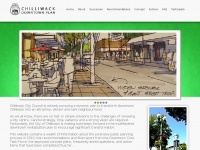 A profile of Chilliwackdowntownplan.ca was found on the social network Twitter. The web server used by Chilliwackdowntownplan.ca is run by City of Chilliwack and located in Canada. This web server runs a few other websites, mostly in the english language. The websites of Chilliwackdowntownplan.ca are hosted by a Microsoft-IIS server and were developed in the programming language ASP.NET. The HTML pages were created with the latest standard HTML 5. The visitor analysis software Google Analytics is used to analyze the visitors of the websites. The website does not specify details about the inclusion of its content in search engines. For this reason the content will be included by search engines.